Cut & Polished and Natural specimens. Perfect for gifts and interior design projects, Also some ammonite species from Morocco too. Madagascan ammonites are usually dated to the Jurassic-Cretaceous period. Ammonites first appeared around 240 Million years ago during the Triassic period. They descended from straight shelled Cephalopods, Orthoceras being a well known species characterised by its long straight chambered body. Ammonoids and their relatives in general, go all the way back to the Devonian, so by the time the Triassic came around, there was many well evolved species of Ammonite in existence. It is thought that the Permian extinction, 252 Million years ago, may have given the newly formed ammonite species a helping hand in becoming so prolific. At the end of the Permian, some 96% of all marine life, and 70% of terrestrial life became extinct. It is one of the worst extinction events the world has ever experienced. At the end of the Triassic era, only one species of ammonite survived. Amazingly, from this one species, they began to thrive again and became widespread during the Jurassic and Cretaceous. It was at the end of the Cretaceous that ammonites, along with dinosaurs and many other species finally became extinct. 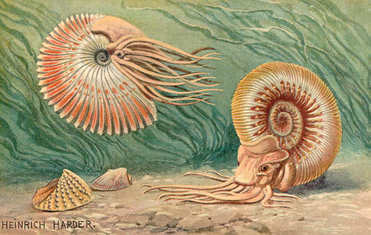 The Nautilus, a cousin of the ammonite however, survived and is frequently found in the warmer oceans of the world today. Cleoniceras besairei ammonite fossils from Tulear, Madagascar. These are classic Albian stage (Cretaceous) fossils and are around 110 Million years old. Larger size collector ammonites, and a few smaller specimens for good measure. Perisphinctes and Lytoceras ammonite fossils from Tulear, Madagascar. These are classic Albian stage (Cretaceous) fossils and are around 110 Million years old. All come boxed and labelled, ready for your collection. These are a better grade than the standard ones and ideal for collectors. ​Found in Mahajunga Provence, Madagascar, 115 Million Years, Cretaceous (Albian) Natural ammonites. Cleoniceras besairei/cleon ammonite fossils from Tulear, Madagascar. These are classic Albian stage (Cretaceous) fossils and are around 110 Million years old. All come boxed and labelled, ready for your collection. Found at Mahajunga, Madagascar, Cretaceous age. (Albian stage). Free stands included. These are beautiful Calcite replaced ammonites with full mineralised chambers, the colors of which are beautifully satisfying - just as nature intended. Dichotomosphinctes antecedens sp. Found in Tulear Region of Madagascar, Oxfordian stage, about 160 Million years old. Cretaceous age (Turonian), Morocco. Asfla, High Atlas Mountains. Beautifully prepared and cleaned fully of matrix back and front, and a little bit left as a perch. Very beautiful collector grade fossils. We also have some other polished ammonites in this section, some from this area, and some from others.